Phoenix, AZ - December 6, 2006 -- Slide-Lok continues its steadfast growth in the emerging market for garage cabinets and garage storage through the addition of Slat-Wall wall storage and accessories. Slide-Lok’s aggressive product line development is driven through their dedication to providing customers with high quality and attractive home storage products. Through the offering of Slat-Wall wall storage and accessories, Slide-Lok is now better able to serve its expanding customer base by further addressing the need for organization in the garage. The new Slat-Wall organization system is the perfect accompaniment to Slide-Lok’s plywood garage cabinets and garage storage systems. 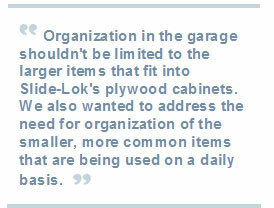 For more information on Slide-Lok garage cabinets and garage storage systems and their patented and innovative design advantages, contact Slide-Lok directly at 800-835-1759, or visit them at www.slide-lokofthebayarea.com.